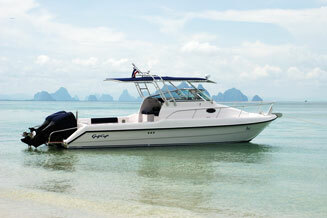 June 2008 marked the arrival of another new Walkaround 31 “ Rose”, destined for Koh Samui. Her owner flew over to Phuket to take delivery and to conduct sea trials and training. The wet weather knew we required a clear window for the weekend and the rain and wind subsided and two full days of beautiful cruising and owner training were conducted. “ Rose” Named after the owners late Aunt, then spent the next week being relocated and secured at her new home Koh Samui. Again this 31 equipped with twin 200 hp Suzuki’s gives great performance with fantastic economy. A longer sunshade, exterior cockpit table, bow sunpad were all custom requests. New style twin swim platforms were a first for the factory and were executed perfectly, adding extra space to the transom area. A truly perfect weekender.